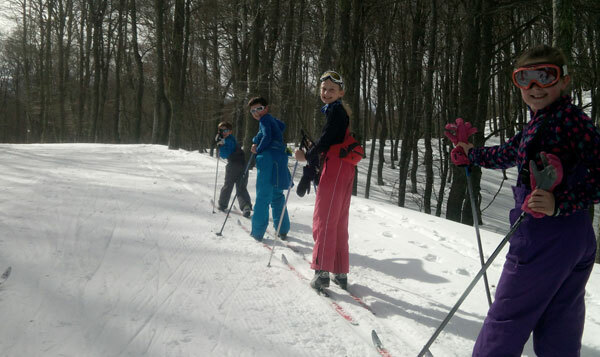 It is not always easy to choose a ski resort for the busiest week of the season – February Half Term. I was seriously worried that I had messed up. Not only had I chosen quite a small ski resort in the Pyrenees with only one main access point – a gondola – but also a resort whose closest city – Toulouse – was on the same February holiday period. I’d envisioned long queues in the morning and packed terraces at lunchtime. As it turned out the worst queue was off the mountain, but I’ll come back to that! Toulouse is just 1.5hrs from the town of Ax les Thermes in the French Pyrenees. Locals commute to Ax by train as the station is in the town centre, and over 800 people each weekend day arrive this way. However, we wanted to have the flexibility of a car so had rented a vehicle for our stay. In an endeavour to be first in the lift queue, we breakfasted early only to be told by one of the hotel staff that all the lifts were shut due to high winds. I’d heard of Ascou, a smaller local ski area reported to be open, but with fears of that being packed, on recommendation of the Tourist Office, we headed for the Col du Chioula for some cross-country skiing. Tickets purchased and kit rented we spent a few minutes on the flat area getting to grips with the little, lightweight narrow skis and the soft boots. It’s over 15 years since I last tried cross-country skiing in Kimberley, BC and I had forgotten everything. The front of the cross-country ski boots simply clip in to a toe piece on the ski. Our little group of seven (four children) were keen to get moving up the ‘green trail’. Following narrow cross-country tracks in the snow, we made good progress uphill, your heel lifts and helps to push and glide the skis along. Slightly longer ski poles with angled baskets are helpful for keeping the uphill momentum. The downhill sections proved trickier for me, cue laughter from everyone, a lot of tumbles from me and a close encounter with a friend who decided he should fall over rather than be pushed. After lunch I was persuaded to try again and this time we all conquered the longer ‘blue trail’. 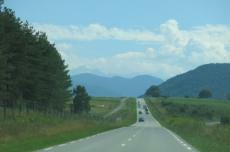 Opening up stunning panoramas across the Pyrenees, we headed up to 1600m. We felt so lucky to have had bad weather to give us all this experience. The children loved it; my youngest, just 8 years old, needed a bit of a ‘tow’ up the longer, uphill sections, but the downhill they mastered much more quickly than I did. Day 2 and 90mph winds still blowing, we decided to find the ‘secret hot springs’, which a friend had told me about. 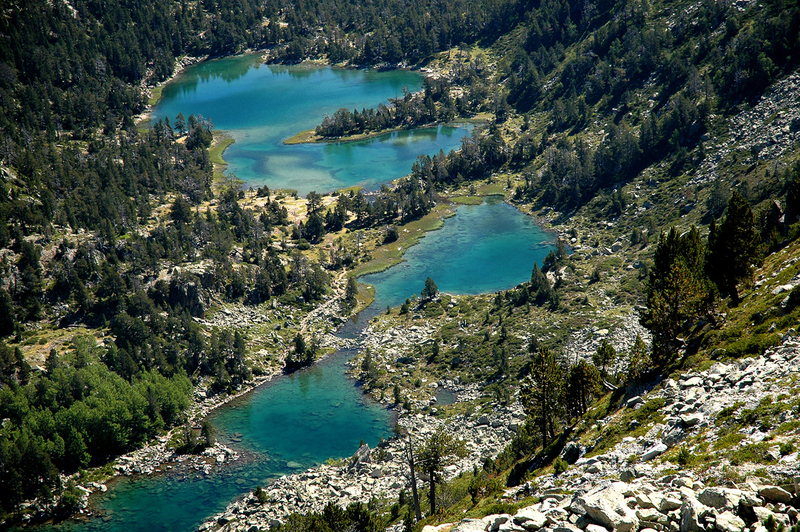 Not promoted by the region, they are tucked away on the GR10, the main hiking route that spans the Pyrenees from the Atlantic to the Mediterranean. After a 15-minute uphill hike we found them. All prepared with swimming costumes under our ski clothes, it didn’t take us long to submerge ourselves in the toasty sulphuric water. It was warm, not super-hot, and quite smelly (!) but on extracting ourselves suddenly the water felt a whole lot hotter! There are three small pools literally on the side of the mountain – an incredible experience to find them and one we will remember forever. Finally we made it up to Ax. Overnight the winds had dropped leaving a drizzly morning that we knew was forecast to clear. There were no queues, so we hopped straight on the access gondola up to Bonascre – one of the three main areas of Ax 3 Domaines. From Bonascre we took the high-speed six chair ‘Lievre Blanc’, and then the ‘Tute’ six-man, and were treated to about half a foot of fresh snow. The early birds definitely catch the powder – although we managed to find fresh tracks across the whole area all day, and even on our second day there was still fresh snow to be found through the trees. The ski area was busy, as expected, with a couple of bottlenecks at the Rebenty chair and the two-man ‘Savis’. With 25 million+ euros being invested in the next three years though, these queues will ease with the replacement of these slower chairs and with it the creation of several new runs. We discovered restaurant ‘Le Louzat’ – a fabulous spot for lunch tucked away in the woods, arriving early to get a table on the terrace. We decided to head up to Ascou for our last ski day on the recommendation of a local friend. She said it is a special place, quiet and with runs through the forest. She was right. Just a twenty-minute drive from Ax – les -Thermes, Ascou-Pailheres sits just off the road up to the Col du Pailheres (closed in winter). There are only 15km of slopes and seven lifts, but for a day we loved it. The beginners’ area was very busy but on the higher draglifts we had the slopes almost to ourselves, not bad for the busiest week of the season! The runs cut through the forest and feel a little like some of the smaller Canadian resorts I have skied in. Lots of small off-piste sections you can cut through and just one base café but with excellent coffee. The terrace overlooks the beginner ski area and we enjoyed a peaceful coffee in the sunshine while the children skied the beginner button lifts and little Fun Park. We all loved discovering this area of the French Pyrenees and having a car rental meant we could explore Chioula and Ascou as well as skiing the main ski area at Ax 3 Domaines. We tried to get in to the recreational spa after skiing – Les Bains du Couloubret, but this was where the real queues were. After a 30-minute wait and no progress we decided to stick with the natural foot spa in the centre of the town. Each evening this becomes a focal point for people to sit and chat – we all loved it, the naturally occurring sulphuric water coming out at 77 degrees. The town of Ax originated in approx. 800AD with the old hospital and foot spa alongside dating back to the 1200s. Spa tourism thrived during the 19th Century. Ax-les-Thermes is a town full of history with its narrow old streets to discover and quaint bars and restaurants. For further information on the ski area visit www.ax-ski.com. For packages to Ax 3 Domaines try Ski Weekends. With thanks to Intersport for ski rental.